BEIRUT, Lebanon (CNN) -- A suspected car bomb struck a United Nations peacekeeping patrol Sunday in southern Lebanon, killing five Spanish peacekeepers and wounding three others, Spain's Defense Minister Jose Antonio Alonso said. "The most probable cause, pending final analysis, is that the explosion came from a car bomb that was remotely detonated as the Spanish vehicle went by," Alonso told reporters in Madrid, Spain. Alonso said Spanish patrols had increased security in recent weeks after various attempts to destabilize the region. He said Sunday's attack happened on a road used daily by the Spanish peacekeepers. Those killed were between the ages of 18 and 21, he said. Lebanese security sources said the suspected bomb ignited ammunition inside the peacekeepers' armored vehicle, causing a secondary explosion that engulfed the vehicle in flames. The explosion occurred in the eastern sector of south Lebanon in Khiam Valley, near the town of Dardara, Lebanese army sources said. More than 1,000 Spanish troops are serving in the United Nations Interim Force in Lebanon, Spain's Defense Ministry said. 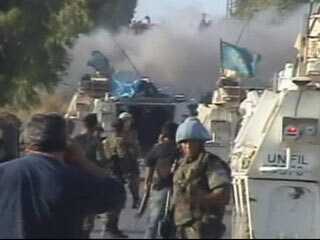 There are about 15,000 UNIFIL troops in southern Lebanon. The force was set up in 1978 after Israeli forces withdrew from Lebanon, but more troops were added following last year's war between Israel and Hezbollah forces in Lebanon. Hezbollah condemned Sunday's blast and said it was intended to destabilize the country, Reuters reported. "The attack hurts the people of the south and of Lebanon," Hezbollah-linked al-Manar television said, according to Reuters. CNN's Brent Sadler, Al Goodman and Carolina Sanchez contributed to this report.